Q:I Need to store and ship a plastic syringe full of liquid or oil. How will I keep it from leaking or spilling? 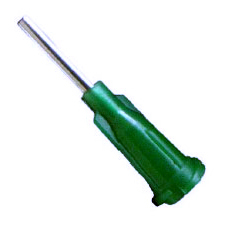 A:Use a Luer-Lok Syringe cap! Luer-Lok (Aka Luer-Lock) caps are designed to fit any standard syringe or squeeze bottle that utilizes the standard Luer Taper fitting. A:(From WikiPedia) The Luer taper is a standardized system of small-scale fluid fittings used for making leak-free connections between a male-taper fitting and its mating female part on medical and laboratory instruments. A: (From WikiPedia) There are two varieties of Luer taper connections: locking and slipping. "Luer-Lok" and "Luer-slip" are registered trademarks of Becton Dickinson. "Luer-Lok" style connectors are often generically referred to as "Luer lock", and "Luer-slip" style connectors may be generically referred to as "slip tip". Luer lock fittings are securely joined by means of a tabbed (or threaded) hub on the female fitting which screws into threads in a sleeve on the male fitting. Slip tip (Luer-slip) fittings simply conform to Luer taper dimensions and are pressed together and held by friction (they have no threads). We hope this ends the confusion. Maybe it adds more. Contact us for help with your specific application!